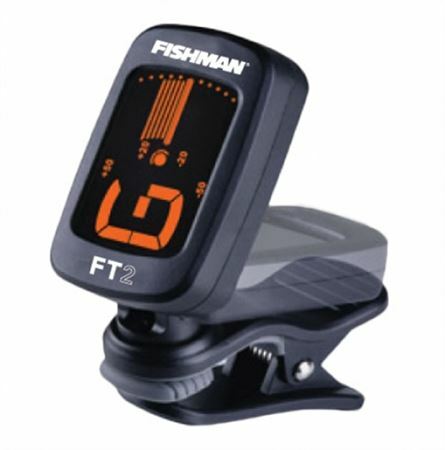 Shop Fishman FT2 FlipOn ClipOn Chromatic Tuner from AMS and enjoy Fast & Free Shipping. The Fishman FT-2 digital chromatic tuner provides quick and accurate tuning for most instruments with a simple flip. Clip it on, flip up the display and the FT-2 powers-on. Flip it back down when you’re done tuning shut if off. The large, high-contrast, backlit display is easy to read and shows pitch with ±1 cent accuracy via tuning needles and a multi-color backlight. It is also incredibly lightweight—weighing only 21 grams—so it won’t affect your instrument’s tone. When flipped down to the off position, it’s incredibly low-profile, so you can leave it place while you’re playing and the soft clip won’t harm many finishes. Bought 2, one was bad and Inop. AMS replaced it with another one and it worked fine. I love everything about these tuners. Soft clips, easy on and off, just by lifting and lowering, fully rotatable for viewing, and very accurate tuning with an easy to read screen. I bought one initially for my electrics for starters, then two more on the 2 fer Tuesday to put in my acoustic gig bag and one for my work bench. Worth every cent and a bargain to begin with. Also comes with a battery. Can't beat it! Just clip it on fold it up to use or down to shut off. Nice and accurate. Turns on when you flip it up. Very accurate. cross checked with tuner on helix and headrush as well as a TC tuner I have and right on. Pretty cool that there is no on/off switch, just turns on when you flip it up. Great tuner, very small, and tunes my electric just fine. Very covenant and east to use. Like the fact that it shuts off automatic once closed don/t have to worry about battery going dead.